The McDonald Observatory Logo. Courtesy of the McDonald Observatory. Image available on the Internet and included in accordance with Title 17 U.S.C. Section 107. Painting, Portrait of William Johnson McDonald. Courtesy of the McDonald Observatory. Image available on the Internet and included in accordance with Title 17 U.S.C. Section 107. 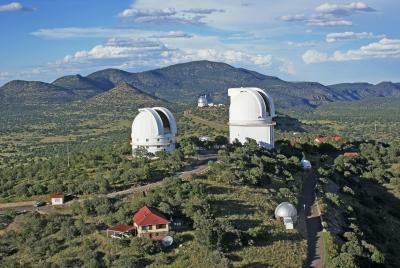 UNIVERSITY OF TEXAS AT AUSTIN MCDONALD OBSERVATORY. 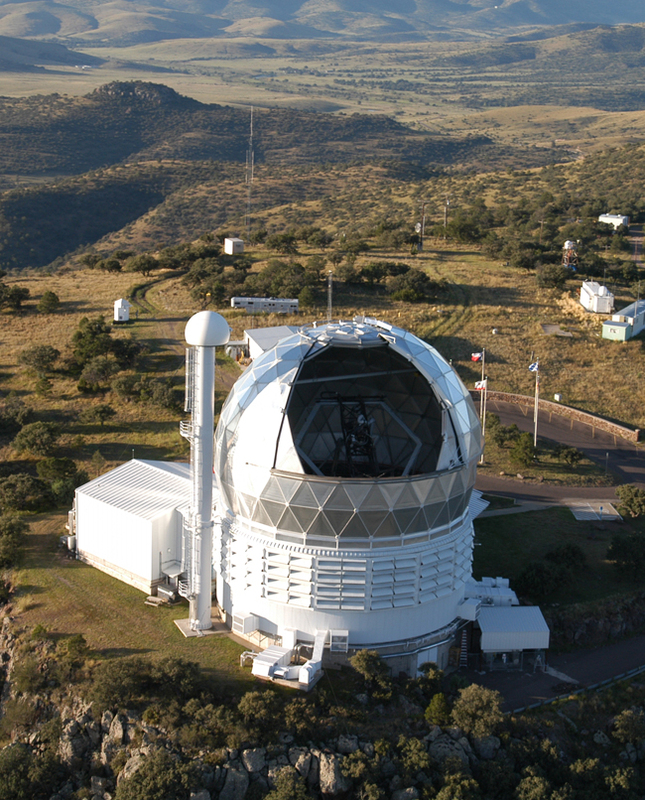 The McDonald Observatory of the University of Texas at Austin is located on Mount Locke, near Fort Davis. It owes its foundation to the unexpected legacy of William Johnson McDonald, bachelor banker of Paris, Texas, who died on February 6, 1926, at the age of eighty-one. 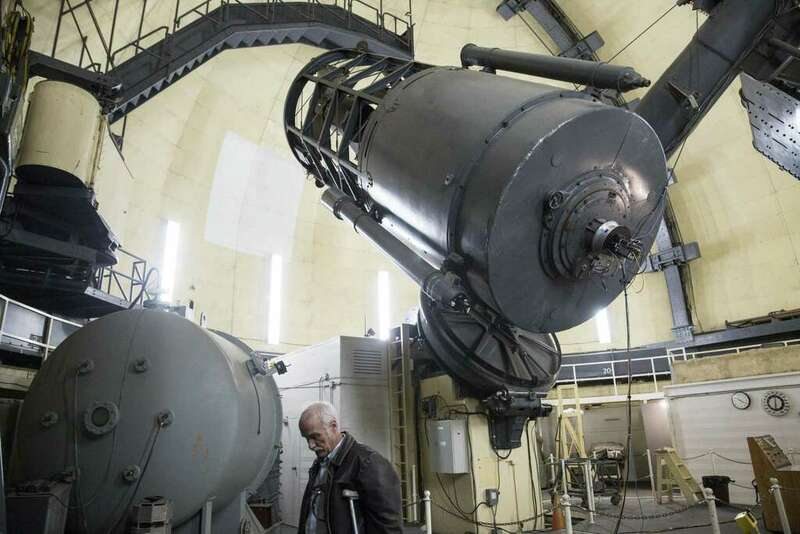 Initially his will was contested, but after protracted legal actions the university received $850,000 for the establishment of an astronomical observatory. McDonald is said to have thought that an observatory would improve weather forecasting and therefore help farmers to plan their work. The university, having no astronomy faculty, signed a thirty-year collaborative agreement with the University of Chicago in 1932, whereby Texas financed the telescope and Chicago provided the astronomers. Warner and Swasey, Incorporated, of Cleveland, Ohio, was awarded the contract for building the observatory, including the sixty-two-foot-diameter concrete and steel foundation built on solid rock and the mechanical parts of the eighty-two-inch telescope, then the second largest in the world. Warner and Swasey also figured the main and secondary Pyrex mirrors from disks cast by Corning Glassworks of Bradford, Pennsylvania. On completion the dome, seventy-one feet in height and sixty feet in diameter, was sheathed in metal and painted an aluminum color. 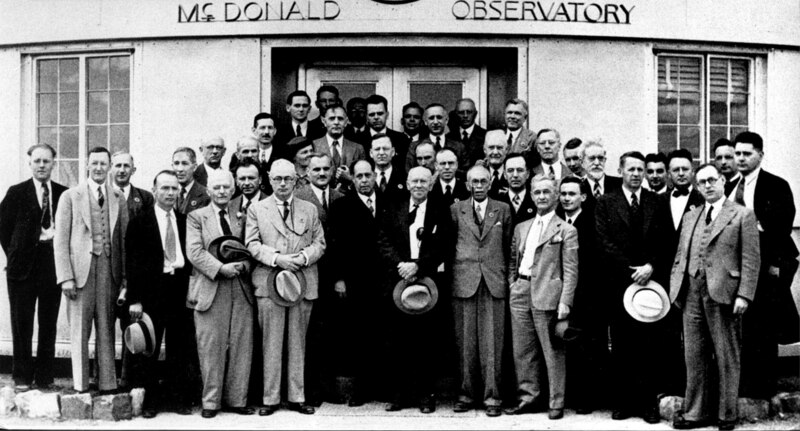 The world's leading astronomers gather at the dedication of the McDonald Observatory on May 5, 1939. Courtesy of the McDonald Observatory. Image available on the Internet and included in accordance with Title 17 U.S.C. Section 107. Portrait of Harlan J. Smith, former director of the McDonald Observatory. Courtesy of the McDonald Observatory. Image available on the Internet and included in accordance with Title 17 U.S.C. Section 107. The Otto Struve Telescope at the McDonald Observatory. Courtesy of Carolyn Van Houten and the San Antonio Express-News. Image available on the Internet and included in accordance with Title 17 U.S.C. Section 107. 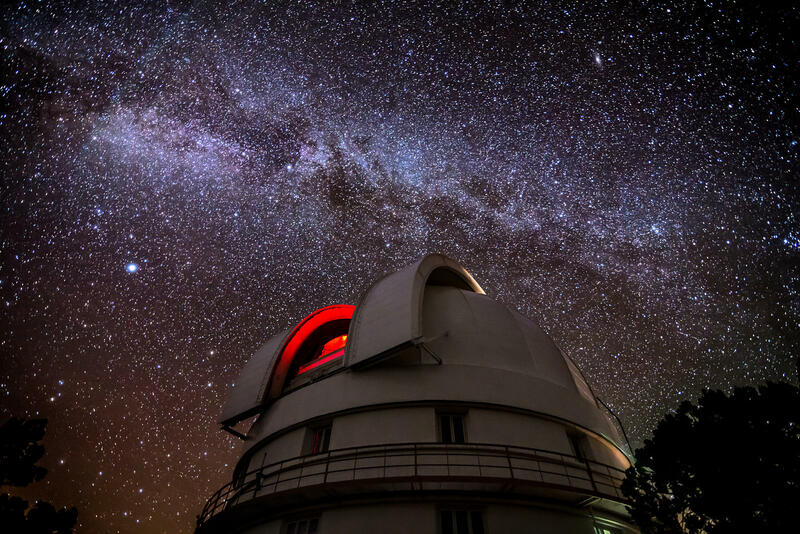 The Milky Way above the Otto Struve Telescope at the McDonald Observatory. Courtesy of Clark Crenshaw Photography. Image available on the Internet and included in accordance with Title 17 U.S.C. Section 107. The director of the University of Chicago's Yerkes Observatory, Otto Struve, Russian-born scion of a famous astronomical family, provided the telescope's concept and became the first director of McDonald Observatory in 1932. The chosen site, in the Davis Mountains, is located primarily on the cattle ranch of the pioneer settler G. S. Locke; it was donated by Violet Locke McIvor and renamed Mount Locke for her grandfather. Development of the site was supplemented by a land donation from the adjoining ranch made by the estate of Judge Edwin H. Fowlkes, which brought the site area to 400 acres. The location was regarded as ideal, not only because of minimal dust and artificial light, both obstacles to astronomical observation, but also because of the proportion of clear night skies. Dedication of the telescope took place on May 5, 1939, with a symposium attended by most of the world's leading astronomers. World War II severely restricted astronomical research in many parts of the world, but McDonald continued as an active observatory, gaining the services of several European astronomers who fled from their invaded homelands. At the end of the war McDonald astronomers received many prestigious awards from several American and European astronomical societies. The Hobby-Eberly Telescope. Courtesy of the University of Texas at Austin. Image available on the Internet and included in accordance with Title 17 U.S.C. Section 107. Dutch immigrant Gerard P. Kuiper was director from September 1947 to December 1949 and again from September 1957 to March 1959; Struve was honorary director to 1950. Bengt Strömgren of Denmark was director from January 1951 to August 1957 and William W. Morgan of Chicago from April 1959 to August 1963. 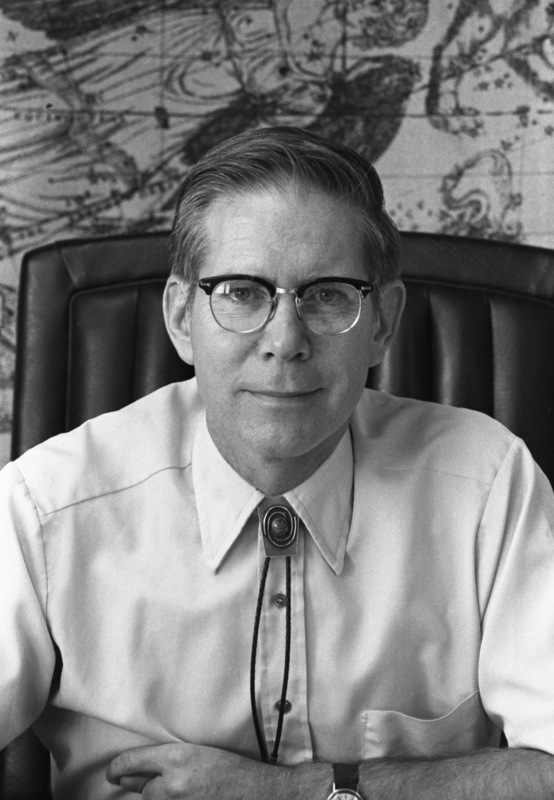 At the end of the original operating agreement between the universities of Texas and Chicago, UT had organized an astronomy department, and in September 1963 Harlan J. Smith was appointed director of the observatory and chairman of the UT Astronomy Department. Under Smith's guidance, both the department and the observatory underwent enormous expansion, compelling him to relinquish the chairmanship in 1979. He retired as director in 1989 and was succeeded by Frank N. Bash. The primary telescopes at McDonald and their dates of installation are: 82-inch Struve reflector (1939), 36-inch reflector (1956), 107-inch reflector (1969), 30-inch lunar laser ranging reflector (1981), and 16-foot radio dish for millimeter wavelengths (1967, closed in 1988). The largest telescope, the 107-inch reflector, was partly financed by NASA for studying the close approaches of Mars in 1967 and 1969. Corning produced the mirror disks of fused silica by a novel process, and these were figured by Davidson Optronics of California. The optical system, designed by Charles Jones and John O'Rourke, is of the Ritchey-Chrétien wide-field type. The Westinghouse Corporation built the mounting. The main coudé spectrograph, currently the world's largest, was designed by Robert G. Tull of the UT faculty. Formal dedication took place on November 26, 1968. The University of Texas Radio Astronomy Observatory was a large array of antennas, built by Austin astronomers, situated near Marfa and designed to survey the northern sky for radio sources at meter wavelengths. It was shut down in 1989 after completing the survey and dismantled soon after. 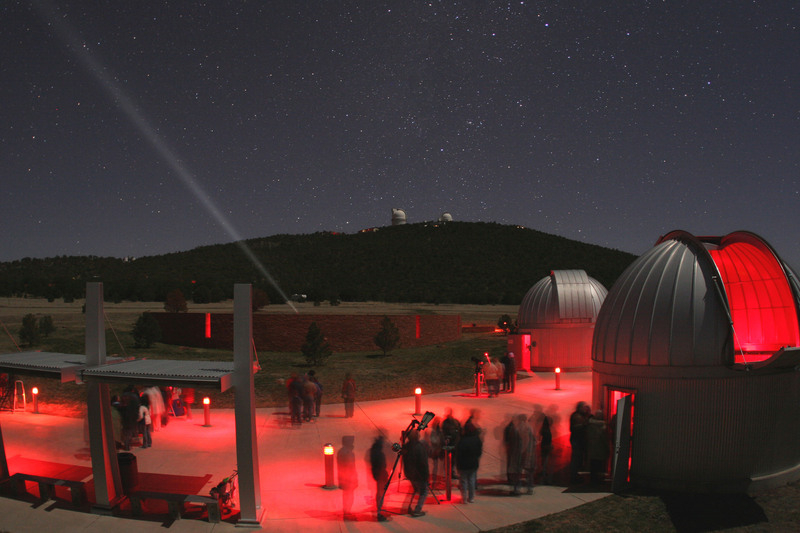 The McDonald Observatory hosts a Star Party at the Visitors' Center. Courtesy of the McDonald Observatory. Image available on the Internet and included in accordance with Title 17 U.S.C. Section 107. Construction of the Hobby-Eberly Telescope on Mount Fowlkes, adjacent to Mount Locke, began in 1994. Its design incorporates ninety-one meter-sized hexagonal mirrors mounted on a frame to give an effective collection area 8.5 meters in diameter. At a fixed altitude setting of fifty-five degrees, almost all objects in the northern sky are accessible when the telescope is appropriately turned on a vertical axis, and they can be observed for one to two hours through a moving prime focus tracker. The cost is a small fraction of an equivalent two-axis instrument. The project is a joint enterprise of the University of Texas at Austin, Pennsylvania State University, Stanford University, Ludwig-Maximilian University in Munich, and Georg-August University in Göttingen. All instruments at McDonald are now operated electronically under computer control. The W. L. Moody, Jr. Visitors' Information Center at the foot of Mount Locke offers exhibits, tours, and evening star parties with telescopes up to twenty-four inches in aperture. McDonald also produces the bimonthly magazine StarDate and radio and television spots. Dedication of McDonald Observatory (Austin: Swasey, 1939). David S. Evans, "McDonald Observatory," Discovery, Winter 1982. David S. Evans and J. D. Mulholland, Big and Bright: A History of the McDonald Observatory (Austin: University of Texas Press, 1986). Handbook of Texas Online, David S. Evans, "UNIVERSITY OF TEXAS AT AUSTIN MCDONALD OBSERVATORY," accessed April 18, 2019, http://www.tshaonline.org/handbook/online/articles/kcu28. Uploaded on June 15, 2010. Modified on June 8, 2017. Published by the Texas State Historical Association.